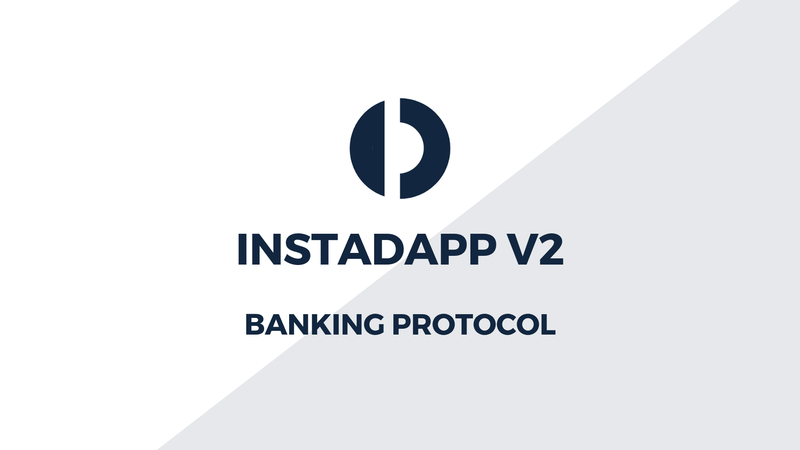 InstaDApp v2 — Banking Protocol. Banking is the core infrastructure of the financial world and vital to the survival of an economy. Their role to manage wealth led to a tightly regulated industry. They collect, distribute the money and earn a living from net interest. Yet, being a fully centralized entity brings lots of caveats. Blockchain technology removes the censorship and gives power back to the people. Ethereum made it easy to build decentralized protocols. Lots of new protocols are springing up these days. InstaDApp is envisioned to build a mashup of all the segregated protocols and to build a banking entity around it by grouping them all. 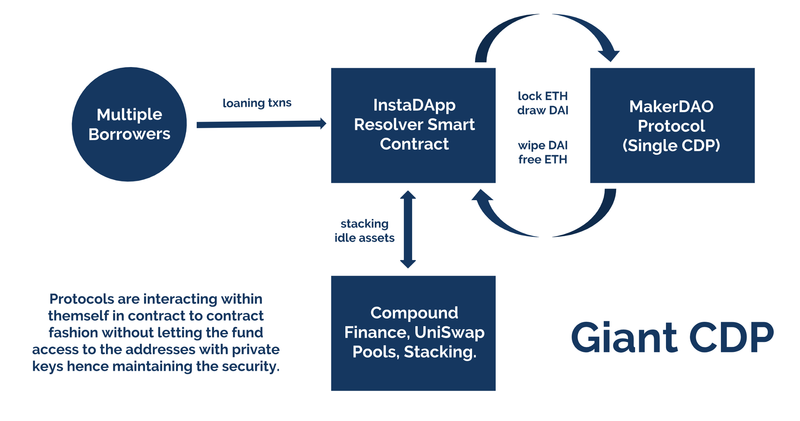 We decided to invest our time & energy into the permissionless debt market as explained previously and in this article, we find it worthwhile to share our technical plans with InstaDApp as the core banking model which we plan to achieve via aggregation of different DEFI protocols. To give you an idea, we already implemented the fee abstraction on InstaDApp CDP portal by internally swapping ETH for MKR via Kyber Network and eventually MKR is paid as fees to MakerDAO protocol on the fly making it super easy for non-technical users without actually knowing what’s happening under the hood. Another great use case, we are trying to demonstrate is to “utilize idle assets in protocols”. 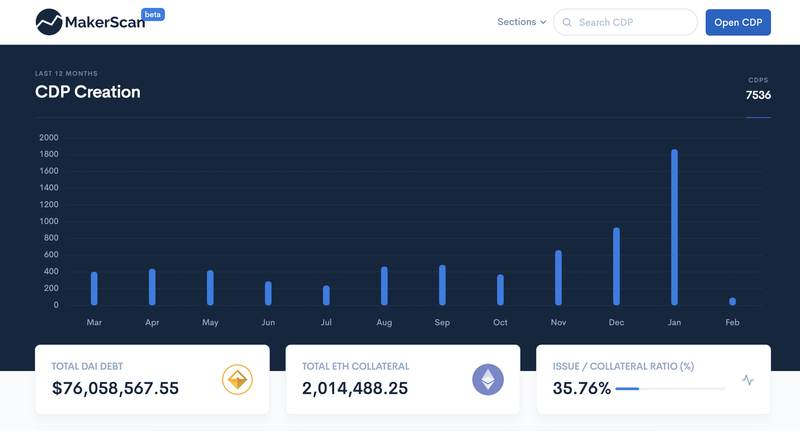 At the time of writing this, MakerDAO Protocol alone has more than 2,000,000 ETH locked, all idle and after factoring the current issue-to-collateral ratio (35%), little more than 30% is technically not collateralized. Right now, InstaDApp contract owns 99 CDPs with over 4000 ETH locked via our platform (Source). We are consistently figuring out a way to make use of the idly locked ETH to generate cash flows, reward depositors & build a sustainable business around it. Actually, that’s the Warren Buffet Style. Berkshire Hathaway, being an Insurance Business accrues lots of incoming premium overtime which needs to be paid back at the end of insurance tenure and on an assumption that not all the people will claim back their insurance, the company has enough float money to invest and generate cashflows out of money they technically don’t own. In a similar fashion, we are brainstorming many innovative ideas to increase the usage of “float money” which are idly locked up in DEFI contracts. The concept of “Giant CDP” will surely show some visibility on it. Think of it as multiple borrowers managing single CDP. Technically, its just using MakerDAO as a cash-generating (DAI) protocol. This will allow us to employ the uncollateralized assets in the CDP to some other cashflow generating protocols like Compound Finance, Stacking, UniSwap Pool etc. Bob deposits $100 worth ETH on InstaDApp contract and takes 10 DAI as a loan which equates to 10% issue-to-collateral ratio. InstaDApp contract internally draws 10 DAI as a loan from MakerDAO and keeps $30 worth ETH as collateral, which is 3x of the collateral, so Bob is safe to proceed with it. The $70 worth leftover ETH is used to generate interest out from Compound Finance or UniSwap Pool or Stacking all in contract-to-contract fashion without letting Bobs funds access the addresses with private keys. And as a result of this process, InstaDApp has just utilized $70 ETH collateral to generate cash flows to reward Bob for keeping his assets partially idle and to build a sustainable business around it. One of the biggest challenges right now is the “No Privacy” with public blockchains. Nobody would like to publicly announce their financial status to the world. We are keenly tracking the progress of projects which facilitates private transactions on ethereum blockchain like AZTEC Protocol. Also, with the privacy enabled platform, it’s not OK to become a medium of facilitating illicit financial activity in the name of privacy — this is still a big differentiator for the vision of InstaDApp providing banking services on blockchain while complying with all the regulatory requirements. Ethereum explorer oriented towards how financial activities are being performed on blockchain i.e. DEFI protocols (thanks to TheGraph). “Giant CDP” experiment demonstrating the mashup of protocols. Like using the MakerDAO uncollateralized assets to generate cash flows on Compound Finance. We will keep introducing pretty interesting use cases and our full fledge rigid plans are hugely dependent on MCD launch. At InstaDApp, we are committed to growing Decentralised Finance ecosystem and building innovative products around protocols to bring the mainstream adoption of the overall #DEFI industry. If you have any questions, we can get in touch on Twitter. Would love to have your feedback & suggestions. Thanks to Vishva Dave and Samyak Jain.